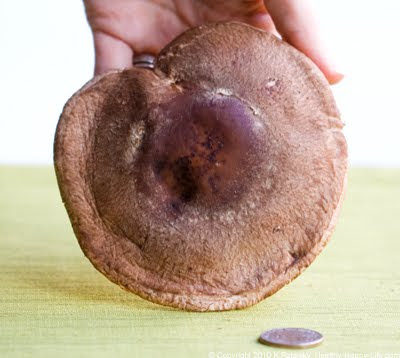 A Giant Shiitake Mushroom and Twenty Ways to Cook it. 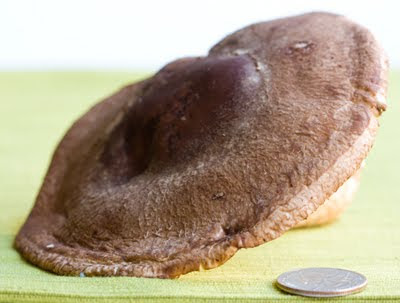 I found this giant shiitake mushroom swimming in a sea of average sized shrooms in the bulk mushrooms bin at Whole Foods. I had just seen the movie Alice in Wonderland, so when I spotted this mysterious, over sized, fluffy fungi, I expected a giant smoke-puffing blue caterpillar to crawl out from beneath the cap and say, "Whooo are youuu?" 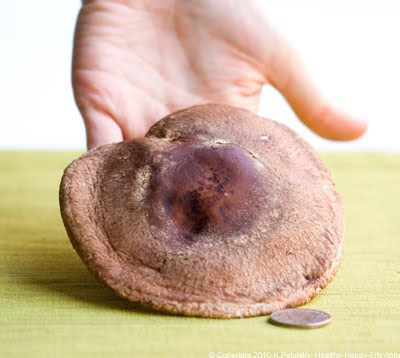 I confirmed the shroom was indeed vacant and stuffed it into my cart, taking extra care of its wide squishy self. How Big? 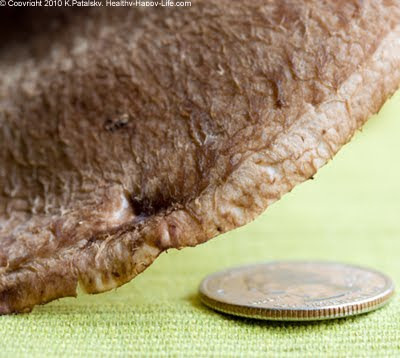 This hefty shiitake is as large as a portabella and stretches over 4 inches wide. It towers over a quarter coin. It's the biggest shiitake I've ever held in my hands. Almost too beautiful to eat! Almost. 1. Mushrooms in soup. Slice thinly and add to soups and stews. Recipe here. 2. Mushroom Bruschetta. I do this often, and love it. Recipe below! 3. Mushroom fajitas on taco night. 4. Raw white button or crimini shrooms in a chopped salad or pizza salad: recipe here. 5. Roasted in Oven. Recipe Below! 7. On top of a veggie burger. Saute with caramelized onions for a perfect veggie burger topper. 8. Simple side dish. A la carte shrooms. So gourmet. 9. Wine marinated and sauteed. Recipe Below! 13. Mushroom flavored rice pilaf. Or just 'rice dish' if you hate the word 'pilaf' as much as me. 15. Spicy shrooms - sauteed with harissa, chilies or sliced jalapenos and served over pasta or veggies. 16. Basic garlic-mushroom pasta with fresh basil. Or tossed in any pasta recipe. 17. Open faced mushroom tempeh bagel or sandwich. 18. Asian style shrooms sauteed in soba noodles. 20. Raw mushroom salad wrap. Chopped mushrooms add depth to your all-veggie wraps. Directions: Saute mushrooms and onions in oiled pan. After about 2 minutes, add in the vinegar and parsley. Saute for a few more minutes - until edges of shrooms start to crisp. Spoon about 1 Tbsp of shrooms onto each slice of baguette bread. Serve. Garnish with fresh parsley. To Make: Simply toss your mushrooms in a few tablespoons of EVOO and a few tablespoons of vinegar - a dash of course sea salt and a lot of black pepper. Broil on high for 25 minutes. You can also roast with other veggies like tomatoes, onions, potatoes, broccoli, brussel sprouts, asparagus or eggplant. In small bowl, add 1/4 cup of wine, 2 Tbsp EVOO, pinch salt and pepper and mushrooms and allow to marinade for 20 minutes before sauteing. The cooked wine will bring out a very savory deep flavor in the shrooms. 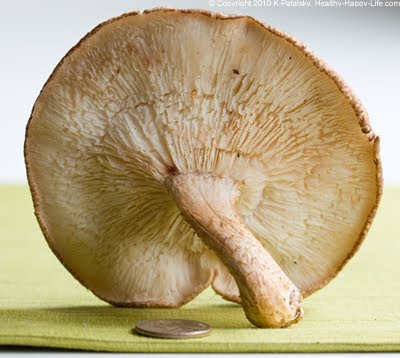 You can also add the wine right to the pan during a normal shroom saute, but in very small increments. Proceed with caution when sauteing with alcohol. Start off on a low heat. I like to use red wine with mushrooms, but white works as well. Do not use cooking wine. Day old drinking wine is best - use your leftovers instead of tossing day old wine. 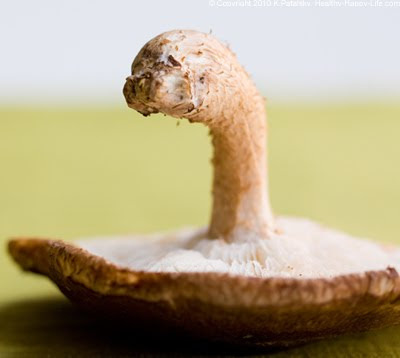 Learn more about mushrooms and vitamin D.
And yes, I enjoyed Alice in Wonderland very much. In 3D it was awesome. 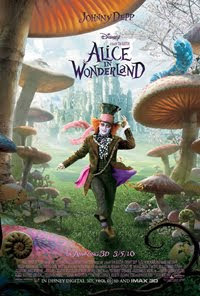 Fun flick and the Mad Hatter was fabulous. *movie poster by Disney.